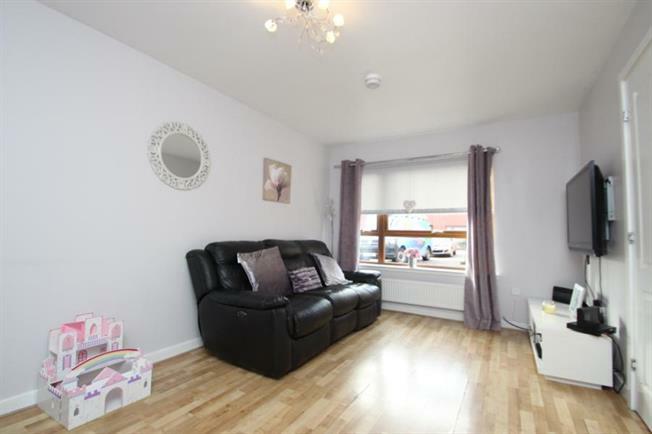 2 Bedroom Semi Detached House For Sale in Irvine for Offers Over £95,000. Attractive and well presented modern two bedroom semi detached villa ideally located within small residential cul-de-sac. The property will appeal to the wider market and will be sure to impress all who view, with the fresh decor, stylish presentation and convenient location plus access to town centre shopping and local schools. The accommodation comprises: Bright welcoming reception hallway with stairs to upper level and access to all ground apartments. The lounge offers a front facing aspect and is finished in neutral dcor. Through the hall you will find a contemporary two piece cloakroom WC and access to the dining kitchen offering ample base and wall mounted units. From the kitchen access is granted to the generously sized private gardens. The first floor landing offers generous storage and attic access plus two double bedrooms, master to the front with the second facing to the rear. This modern family home is completed with the white three piece, tiled family bathroom. Further benefits include: Off road parking, landscaped rear garden with patio timber deck, gas central heating, double glazing. EER Band C.